Genesis 1:1-3:23 preserves the record of the story of creation as revealed by God to the Israelites. Other ancient peoples had a very different understanding of how the universe came to be. One such story is Enuma Elish, the Babylonian myth of creation. Enuma Elish (more accurately, Enûma Eliš, meaning “when on high,” the first two words of the story; it is also known as The Seven Tablets of Creation) was lost for generations but rediscovered archaeologically in Iraq in the nineteenth century. 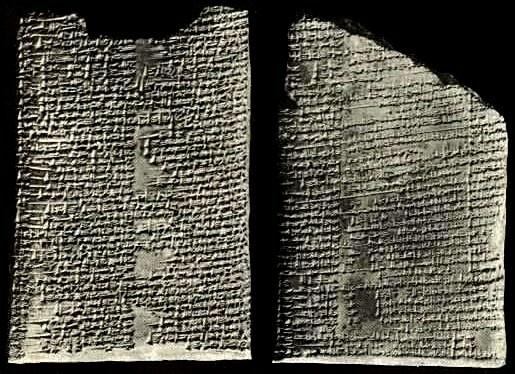 The recovered copies date to the 7th century BCE; historians believe that Enuma Elish as presented was composed in Babylon either in 1700-1600 or 1100 BCE. The origins of Enuma Elish may go back to Sumerian times (ca. 3000-2500 BCE). Translations of Enuma Elish may be found online here or here. The myth began with Apsû, god of the rivers (or fresh water in general), and Tiamat, goddess of the sea (and chaos, winter, and barrenness). Tiamat gave birth to many other gods and goddesses who lived within her, but their continual noise caused great irritation to Apsû, and he sought to have them all killed. Tiamat warned the strongest of her descendants, named Ea (also known as Enki or Nudimmud, the lord of crafts, intelligence, and creation), about the danger. Ea used magic and lulled Apsû into a coma and then killed him. Ea and his consort Damkina took up residence in the corpse of Apsû, and soon Damkina gave birth to Marduk, who would become the god of sunshine and storms and the patron god of Babylon. Tiamat, meanwhile was enraged at the death of her husband Apsû. She took on a new husband, Kingu, created eleven monsters, and set out to get revenge on her offspring for the death of Apsû. Ea and Anu (the lord of the sky) attempt to fight against Tiamat but prove too weak for the task. The gods began to fear that no one could save them from Tiamat’s wrath. Marduk then entered the assembly of the gods. He would take on and overcome Tiamat if the other gods agreed to enthrone him above all other gods. They agreed, and Marduk set out against Tiamat on the clouds with storms. Marduk caught Tiamat in a net, inflated her body with the “evil wind” (a hurricane), and struck her heart with an arrow. Marduk proceeded to capture all the gods who were allied with Tiamat including her husband Kingu. Marduk divided up Tiamat’s corpse into two parts, one to make up the earth, and the other as the heavens. He then made appropriate residences for the other gods, thus establishing different environments and seasons. Tiamat’s spittle was used to make rain. At first Marduk demanded hard labor out of the defeated gods so as to provide sustenance for the victorious gods. Later Marduk decided to make a creature who would do that work instead. The blood of the instigator of Tiamat’s rebellion was needed to make that creature, and Kingu was condemned for the act. Out of Kingu’s blood Marduk and the other gods made human beings. The gods made Babylon as a place of their abode. Enuma Elish ends with praises to Marduk and exhortations to remember his creative deeds. Ever since its rediscovery Enuma Elish has been compared with the Biblical story of creation. Some have attempted to suggest that the Israelites either rewrote Enuma Elish into their own creation story or composed a similar story as a counter-narrative against Enuma Elish. There are certain elements of Enuma Elish that have Old Testament parallels (creation out of chaos, defeat of primordial monsters and chaos, establishment of seasons, creation of mankind; cf. Genesis 1:1-3, 26-27, Psalms 82:1-6, 89:10); such is not unexpected since Israel and Babylon both arise out of the ancient Near Eastern world. Nevertheless the differences between the stories are far greater than their points of contact, and these differences illuminate the differences between the people of God and the pagans around them. Consider the perspective of a person who considered Enuma Elish to reflect their origins and the origin of the universe. Their world is composed of the carcasses of defeated gods. Everything came to be on account of inter-divinity conflicts. He or she was made from the blood of a defeated god and for the purpose of working the ground to provide food for his or her gods and goddesses. Compare such a perspective to what is found in Genesis 1:1-3:23: God spoke all things into existence, exercised dominion over all things from the beginning, and were made without conflict. All things are made by God through His creative Word; mankind is special, having been made in God’s image. Enuma Elish is a valuable resource for us to understand the ideology and perspective of ancient Assyrians and Babylonians in contrast with the ideology of Israel as recorded in the Old Testament. We can better understand what Paul has to say in Romans 1:18-25; people in the ancient Near East certainly recognized the existence of divinity, but the folly of their thinking and the vanity of their mythology is evident. There is little dignity and great terror in a world dominated by the mythology of Enuma Elish; there is reason for great confidence, faith, hope, and love in the Creator God of the Old Testament. May we serve the One True Creator God through His Son Jesus Christ and be saved!